My title uses the Middle English name for lemon in deference to the first English reference to this berry fruit at the beginning of the 15th century. The lemon goes back much further, back to the beginning of civilization. Its earliest identification is associated with the Indus (Ancient Indian/Pakistani) Civilization around 5,000 B.C. (see Food in History by Reay Tannahill for more interesting insights on the importance of food and cookery in history). 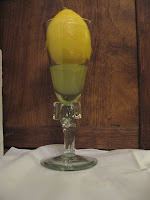 As for modern cuisine, the lemon is an important source of the “sour” flavor, and along with the other four flavor groups: bitter, hot/pungent, sweet, and salty, are considered essential balancing agents in the human body. 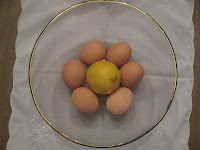 The lemon is an ingredient seen in every kind of food to sharpen flavor alone or in combination with other seasonings. When combined with sweetness, the true essence of a lemon is revealed. What I recall with fondness about the ethnic cuisine of my mother and grandmothers are many things, but in particular those dishes that used lemon as a key ingredient: lemon meringue pie, homemade lemonade, hot lemon pudding served over home-made ginger bread; and then there were my Italian grandmother’s fried artichoke hearts sprinkled with lemon juice. They say that touching and smelling lemons makes one happy. I think this may be true because I’ve gotten the greatest satisfaction from cooking with lemons, and my favorite liqueur is limoncello, a homemade variety introduced to me ten years ago in my cousin’s flat in Arezzo. A close imitation to hers is the Pallini brand (remember to place the liquor bottle in the freezer for several days to get the true affect). Over the years I’ve collected many cookbooks, particularly of the ethnic variety, and embedded as an ingredient in many of the recipes is lemon: The Flavor Principle by Elisabeth Rozin, Memories from Brownie’s Kitchen by Brownie Schrumpf, The Vegetarian Epicure: Book Two by Anna Thomas Nationality Rooms Recipe Book of the University of Pittsburgh, Ciao Italia by Mary Ann Esposito, and Irish Traditional Cooking by Darina Allen, just to name a few. The Flavor Principle (1973) is a wonderful cookbook. I bought my copy (now out-of-print) at CMU’s (Carnegie-Mellon University’s) bookstore many ions ago as a graduate student trying to escape operations research and other quantitative coursework [I should have trusted my instincts more.] The recipes all center on one or more ethnic flavor principles, e.g. lemon-oregano or cultured milk (sour cream or yogurt)-herb or spice. 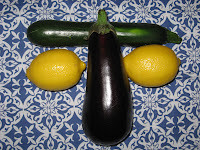 I have many favorites that use lemon, including “Baked Eggplant and Zucchini (Lemon-Oregano)” (201). Place eggplant, zucchini, and onions in fairly deep casserole. Mix remaining ingredients and pour over vegetables. Cover and bake in a preheated 375˚F oven 40-50 minutes. Serves 6. Fresh herbs can be substituted for dried. Memories from Brownie’s Kitchen (1989) is full of hardy Mainer recipes. My favorite is called “Common Sense Coleslaw” (28). Wash and dry completely shredded cabbage. Combine all of the ingredients in a medium bowl, except cabbage. Add cabbage; toss to coat well. Cover; chill at least 2 hrs. [Note: I first soak cabbage in water for about ½ hr. with the ½ tsp salt]. Makes 8 servings. The Vegetarian Epicure: Book Two (1978) is another out-of- print cookbook acquired during my time at CMU. I have many favorites but I would like to share one recipe that I’ve never made, because of my fear of layering cooked meringue shells. I may get the courage to make this scrumptious recipe “Lemon Torte” (326-327) but I would love to have a beta taster go first. Beat the egg whites with sugar until they hold soft peaks. “Sift together the second cup of sugar and the cornstarch and then add it to the egg whites along with the almond extract, and continuing beating until egg whites are stiff. Fold in ground almonds.” Butter and flour 2 10 inch cake pans and divide egg whites between the two, “spreading it as flat and smooth as possible”. Bake layers for 1 ½ hours in preheated 275˚F oven. They should be pale and gold in color and shrinking away from sides. Let them cool slightly in pan then remove and let them cool completely on racks. Combine all ingredients up to eggs yolks in heavy-bottom saucepan. Stir over low heat for 15-20 minutes, or until mixture thickens. Stir with whisk if needed. When thick, remove from heat and beat in egg yolks, one at a time. Return to low heat for 3 minutes only and then remove from heat, stir in butter and let cool, stirring occasionally. Spread half filling over one meringue layer, place the second layer on top, spreading the remaining filling on the top with some filling spread only on the sides of the top layer. Chill torte for at least an hour. Serves 10. Nationality Rooms Recipe Book (1975) was originally designed as a fundraising project for the upkeep of the nationality rooms at the Cathedral of Learning at Pitt (University of Pittsburgh). The cookbook may still be available at the gift shop or you can check the link. The recipes in this book are truly ethnic. I just bought this cookbook recently and have tried one recipe (“Iranian Spinach and Lamb Meatballs”). 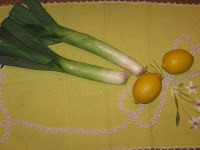 Here are two recipes using lemon that I would like to try very soon: “Leeks-Turkish Style” (155) and “Filled Pastry (Hamantaschen)” (177). Cut leeks into 2˝ long pieces. Wash and drain. Saute finely chopped onions in oil for five minutes. Add leeks, carrots, tomato paste and dill weed. Cover and cook over low heat for 30 minutes, shaking pan and stirring frequently. Add rice, sugar, lemon juice, salt, and water. Cover and cook another 30 minutes or until leeks are tender. Remove from heat and cool. 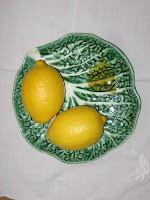 Serve with lemon at room temperature. Serves 6. Pour liqueur over dried and fresh fruits in saucepan and simmer lightly, covered for 10 minutes, until prunes are slightly plumped and some of the liqueur is absorbed. Remove from heat and cool. Place cooked fruit (reserve half of raisins) and liquid into a blender. Blend. Remove. Stir together with ½ chopped nuts and other half of raisins. Prepare biscuit dough and roll out into a 6x16 inch rectangle. Cut into 2˝ squares and then cut each square into 2 triangles. 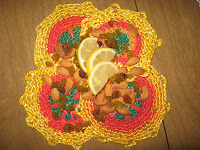 Spread half of triangles with honey(not quite to edge) and then sprinkle with grated orange rind. Cover with plain triangles, seal edges, and flatten with rolling pin. Put 1 heaping teaspoon of filling in center of each triangle, bring up corners, and press firmly together. Place on ungreased cookie sheet and sprinkle with reserved nuts. Bake at 375˚F for about 10 minutes or until lightly browned. Ciao Italia: Traditional Italian Recipes from Family Kitchens (1991) is the first cookbook drawn from the New Hampshire PBS Ciao Italia cooking show hosted by Mary Ann Esposito. Mary Ann has published several other cookbooks, including Ciao Italia in Tuscany. My favorite still is her first cookbook, and there are several lemon-based recipes but my favorite is “Pane di Signora Belurgi”(121), a lemon-egg, Tuscan bread. Making bread had always been intimidating for me, and bread making machines seemed to take away the purpose of making bread at all. It was until I tried this recipe, which yields double the 2 round loaves as suggested, that I got over my fear of making bread. This is a Tuscan-style hard exterior bread. I’ve given it as a gift to many individuals¸ and they have all told me how much they like the bread. As with other breads containing no preservatives, the shelf life is about 3 days, but much longer in the refrigerator for toasting, and all loaves can be wrapped in foil and sealed in a container or bag in the freezer for several months. In bowl or large glass measuring cup, dissolve yeast in warm water. Sprinkle the 3 tablespoons sugar over and stir to dissolve. (I would warm bowl or glass cup before placing warm water and yeast into them, as well as utensil used to dissolve yeast and sugar). Let bowl sit in warm place until foamy, about 10 minutes (I warm up microwave first then put in yeast bowl). Meanwhile, in large bowl that has capacity to hold 10 cups flour, beat 6 eggs with whisk to pale yellow, add 1 cup sugar, melted butter, milk, vanilla, lemon juice, and lemon zest and beat for 5 minutes with whisk. Stir in yeast mixture and mix well. Add the flour 1 cup at a time, mixing with a spatula until it becomes very thick and holds together (may not need all of the 10 cups). Turn dough onto floured surface (you will need to keep surface well floured) and knead until smooth, about 5 minutes. Place bowl in lightly butter deep bowl (not metal), turn to coat, cover the top of the bowl with plastic wrap (or clean towel), and let rise for 2 hour, or until double size (warm microwave for about 1 minute and then place dough into it). Turn dough out into well-floured surface. Divide into 2 (there really is enough for 4 loaves or you could cut recipe in half to make two loaves). Shape into 2 free form loaves and place on greased baking sheet, cover with towel, and let rise in warm place for 30 minutes (I place onto of oven while it is warming up). Preheat oven to 375˚F. After 30 minutes brush top of loaves with egg wash. Bake for 45 minutes or until the bread is nicely browned and hollow-sounding (bread should be done in less than 45 minutes (check at 35 minutes for Esposito’s definition of doneness). Let cool on racks (although you will be tempted to slice into this bread immediately). Finally, let me end with Irish Traditional Cooking (2005), a gift from my son for the holidays. I haven’t had much time to browse the cookbook, but I’ve found several appealing recipes using lemon. In honor of my mother, who made home-made lemonade and would be happy that I’m writing about food, let me present Darina Allen’s version titled “Protestant Lemonade” (269). Dissolve sugar and water into saucepan and bring to boil. Boil for 2 minutes, the allow to cool. Store in refrigerator until needed. Squeeze juice from lemon and add syrup and water. Taste and add more water or syrup if necessary. Add ice and springs of mint. This is a wonderfully thoughtful & instructive post. I like the idea about how touching and smelling lemons makes one happy. I guess in a sense that why they say, "when life gives you lemons, make lemonade.". Speaking of which the lemonade recipe sounds great, and relatively simple to do. Can't wait to try it. Also, the photos by Lena are artistic and whimsically great.